Today I decided to get to the bottom of the missing driver issue on my computer running Windows 7 RC. 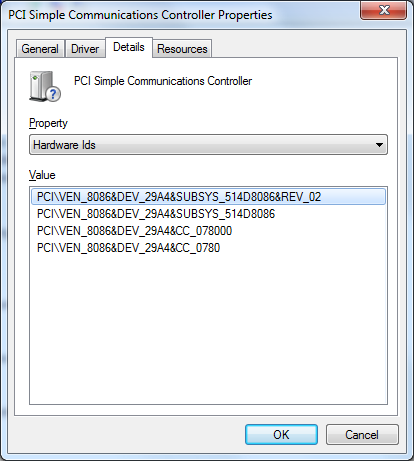 It shows up as PCI Simple Communications controller and it really bugged me since I don't have a modem or a similar device on the motherboard. It turned out that there is a away to identify such a device from the information available in Device Manager. The first step is to open the Properties window for this device and move to the Details tab. After selecting the Hardware Ids in the Property dropdown the device identifiers are displayed. The important ones are the numbers written after the VEN and DEV keywords. The first one is the Vendor ID and the second one is the Device ID. So in my case the Vendor ID is 8086 (from VEN_8086) and the Device ID is 29A4 (from DEV_29A4). All that's left to do know is to go to PCIDatabase.com and enter the ids into the corresponding search boxes. In my case it turned out that it was a device from Intel - Intel Management Engine Interface (HECI). Unfortunately it doesn't have a driver for Windows 7 yet and the Vista one doesn't install. But hey, at least I know which driver is missing.